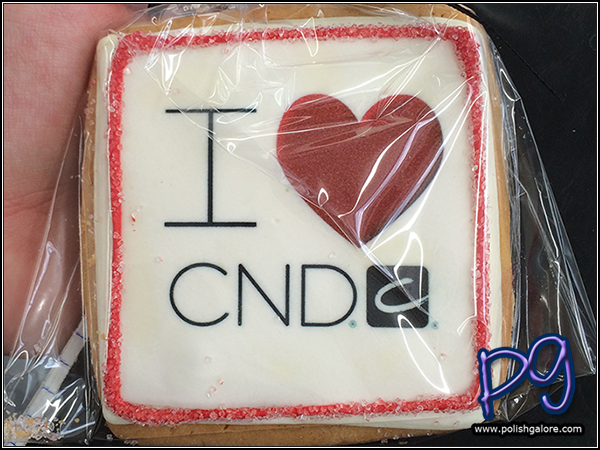 Today, CND held their "I ♥ CND" Event at Central Nails & Beauty Supply in Houston, Texas. 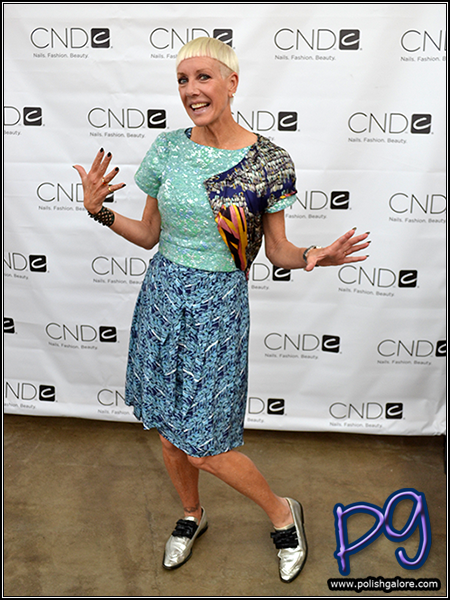 Jan Arnold and the CND Education Ambassadors were on hand to demonstrate the CND Art Walk Summer and Fall 2014 looks featuring CND SHELLAC and VINYLUX. 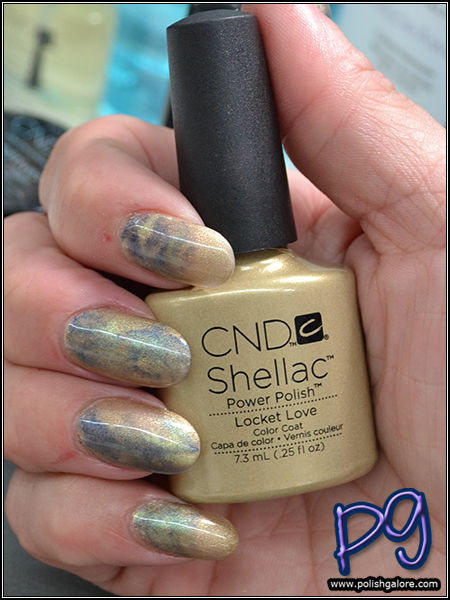 After the Art Walk, CND also held a SHELLAC Certification course for those looking to become a SHELLAC Certified Pro. 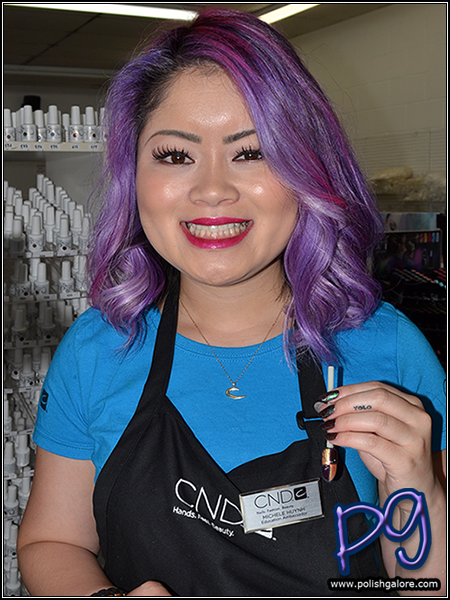 The CND Art Walk featured designs using the Summer 2014 "Paradise" Collection and the Fall 2014 "Modern Folklore" Collection as well as the Summer and Fall Additives. 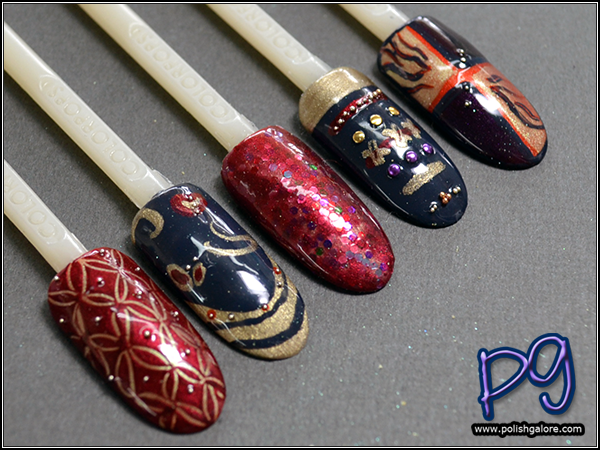 My first two stations featured designs using the Fall 2014 Modern Folklore Collection and Additives to create regal fall nail art looks. First, Education Ambassador Michele Huynh took me through the "Burnished Crest" nail that she created (far right nail in the above photo). She used SHELLAC but you can also use VINYLUX for this look. 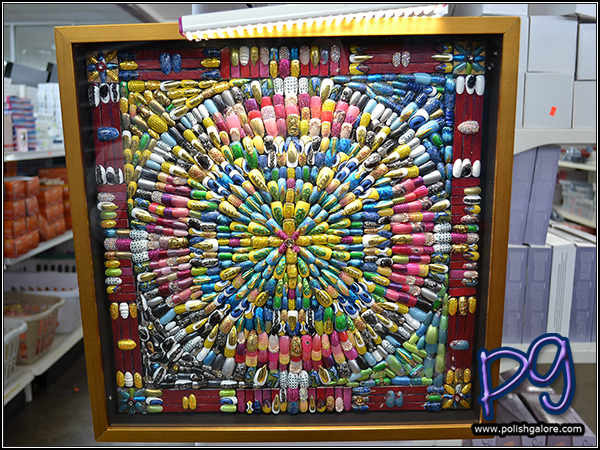 It includes using Additives for shimmer and small bullion beads for added flair. Next, Education Ambassador Shelena Robinson walked me through the incredibly beautiful and incredibly simple Modern Renaissance fall nail design (far left nail). She also used SHELLAC but again, VINYLUX could be used as well. Shelena is pictured here with the nails from The Blonds Fall 2014 Show that she designed. She crafted the guns from this iconic photo strictly by hand only using Retention+ Liquid and Powder. Crazy amazing. Her own nails today were amazing too. She created a watercolor look using CND products. 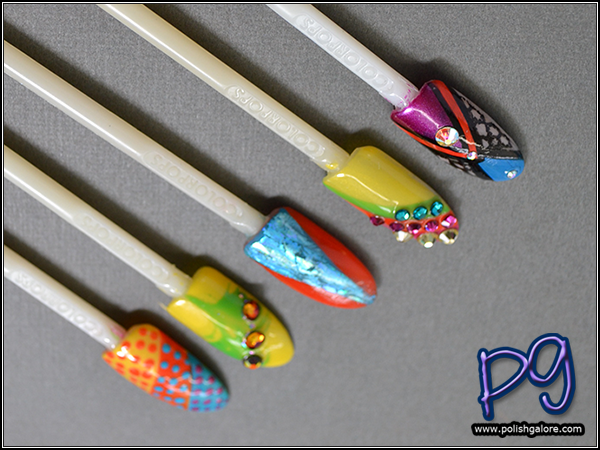 Next on my Art Walk were looks created with the Summer 2014 Paradise Collection. 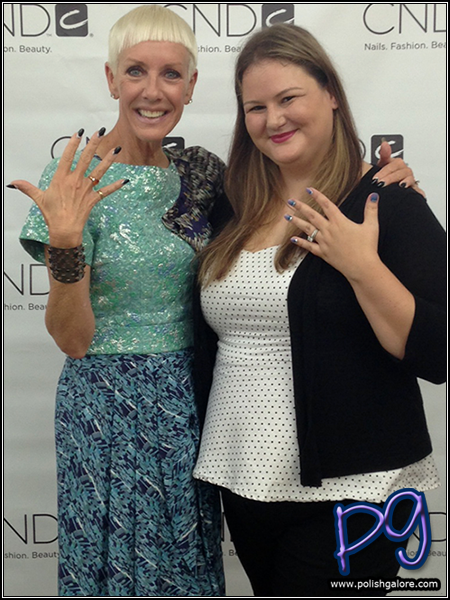 Educational Ambassador Heather Reynosa-Davis showed me how to create the middle nail "Blue Lagoon" using CND SHELLAC and nail foil. TIP: Allow your foil adhesive to dry to clear, then apply your foil. Apply too soon and the foil will be too wet and not apply properly. Educational Ambassador Alfa Romero created a "Dragon Fruit" nail using Summer Additives in Sizzling Sand and Midnight Tide. Next, Educational Ambassador Sylvia Palomino walked me through the entire LookBook, both available digitally and in hard copy, from the Fall 2014 season. They even had the wall art that was created from the Spring 2014 season. Did you know that CND has been apart of Fashion Week for over 17 years? The second to last station on the CND Art Walk was the Education Station. This one is definitely the most important because CND is all about education - both initial and continuing. Being a nail fanatic (not a professional), I'm not eligible for the perks but if you have your license or you know of a salon that wants to become SHELLAC Certified, send them to the CND website ASAP! After you take your SHELLAC Course, there are "Next Steps" to complete in order to get your Welcoming Kit. The last station in the CND Art Walk is definitely the best. It's Jan Arnold! This isn't my first time seeing Jan. We had a 1-1 sit down interview in 2013 and one of the first things she asked me was "Why don't you have your nail license?" Especially with the CND Nail Scholarship Program available, I don't have any good excuses. I would love to go to school so that I can have the education behind my passion but that will have to wait for another day. I also got to see Jan last month at Cosmoprof for a fleeting moment. She hugged me like I was an old friend and we talked shop then too. Jan always has the most amazing manicures, so this time I needed to see what she was sporting. This manicure is going on TWO WEEKS. Look how incredibly shiny and amazing it looks! Jan told me that while she loves short square nails (like what I normally wear), for her, she needs a more feminine almond shape and longer length to balance her short hair. "Short hair, long nails. Always. The almond shape does for the hands what the stiletto heel does for the legs." Jan stated. A timeless but elegant look, perfect for today's event. On my own nails, I created a sponged gradient with VINYLUX. I started with a base of Powder My Nose which is a cream colored creme polish, then sponged on Rapture Blue and Lilac Longing. 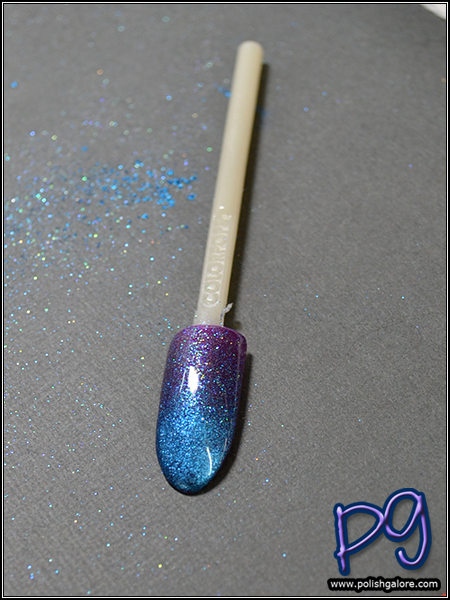 I added a few pieces of hexagonal glitter for sparkle before finishing with CND VINYLUX Weekly Top Coat. Bit of a rookie mistake though. Because VINYLUX is designed to harden to the polish like a gel product, it squeezes out all the air in the polish... and essentially popped my glitter off. 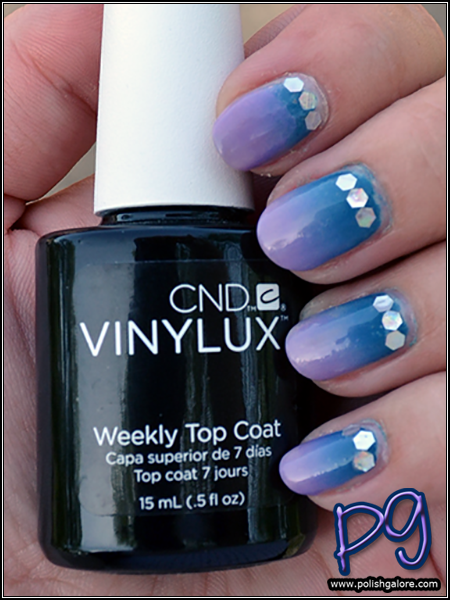 Educational Ambassador Michele told me that the trick is to apply the VINYLUX Weekly Top Coat, let dry 8.5 minutes, then use CND Super Shiney Top Coat (purple bottle) to apply the glitter. Lesson learned. CND holds their #IHeartCND events across the country - be sure you're following the CND social networks for locations and dates! 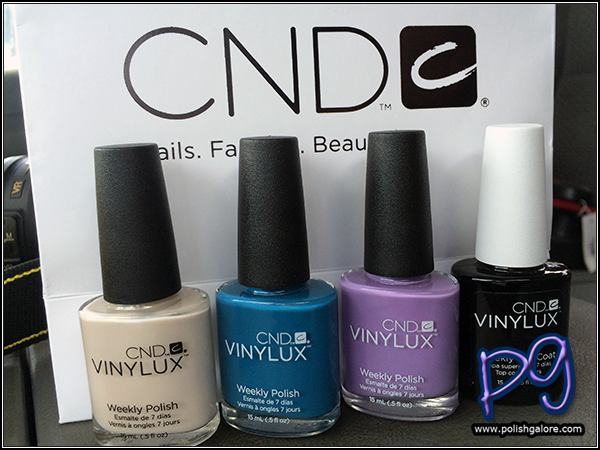 You can purchase CND VINYLUX for $9.90 per bottle at select salons. Join CND via their social media channels Twitter, Facebook, Instagram, Pinterest and YouTube. I really did. It was totally worth the 8 hour drive (round trip) and I'm not even kidding. These are all such fantastic designs! Sounds like such a fun time. And isn't Heather the best? Jan's manicure is so pretty, and you look absolutely great!! (I love that top on you.) The Modern Renaissance nail art is so gorgeous, I can't get over it! I love Michelle's hair. Shelena has cool makeup! I love her lipstick. Dragon Fruit is something I would wear! I clearly need Rapture Blue. Sounds like a wonderful event! How awesome! I definitely will. I won't be around for The Blonds show this year but I got invited to their Design Studio and definitely want to pop in. Oh me too - it was such a pretty shade of purple. Shelena was so nice too. Rapture Blue is definitely a great color and I didn't have any problems with staining which made me a happy camper! That Dragon Fruit nail... swoon! Now I want to try! She didn't finish the blue lines but I preferred it with just the glitter! Looks like such a great event! I'd be all giddy meeting Jan :). Looks like a fun event to attend! I bet you had a blast. I like the folklore collection! This looks so fun!!! I love the designs! She is SO awesome! You can tell she's really passionate about nails. They really had fun with this fall collection!